Earlier in the year, I submitted a picture of my GSD Gretel from last summer when she was a puppy. She has since turned one, gained 72 lbs, and is best friends with her little buddy, Rhett. They are best friends and go everywhere together. When they hear the rattle of the car keys, they are the first ones waiting at the door to go "bye-bye." My husband is in the military, and every time we go to the base, the security police love seeing these two wonderful dogs. Their favorite place to go is the ice cream parlor. The employees know us, and Gretel and Rhett each get a dog-friendly "ice cream" complete with a doggy treat. Car trips are never boring, thanks to these best buddies. Hello Lori, what a great German Shepherd story. 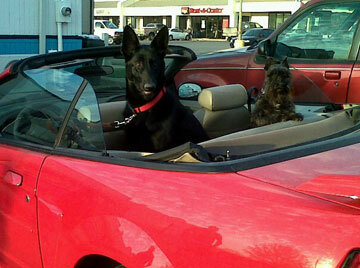 And thank you so much for sharing your great story about your wonderful German Shepherd puppy Gretel and her buddy. And what a wonderful picture - I absolutely love the picture of them both in the car! They look so happy just hanging out doing errands in the car. And what better way to do it than in a convertible.